I don't really bake bread, rolls or anything "bready" too often. I'm very confident with cakes, sweet things, but when it comes to bread I feel a little bit intimidated. I'm not the one to give up easily tho! So... this time it was rolls I wanted to make, something I can make with my little girls and something that we will all enjoy :) There's one cook book in particular that has never ever disappointing me when it comes to baking bread and things related to it. It's Paul Hollywood's "How to bake". 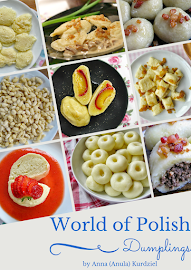 Recipes are very easy to follow and everything is explained really well, in a language that isn't too complicated and intimidating (and there are books like that out there!). This time I wasn't disappointed either! I picked a recipe that I had all the ingredients for (and I usually don't have an ale at home, but I was making beer-braised pork knuckles only day before). The smell when making and baking the rolls was fantastic! The rolls itself had very pleasant and mellow taste, they were delicious with some butter and cheddar cheese. This recipe is definitely a keeper! I hope you'll give it a go - even if you're not feeling very confident with bread making! Tip the flours into a large mixing bowl, add the salt on one side and on the opposite add yeast. Add the butter and 3/4 of the ale. Move the flour around gently with your fingertips and continue to add the ale. You want dough that's soft, but not soggy. Coat the work surface with a little of olive oil, then tip the dough onto it and begin to knead. Knead for about 5-10 minutes. Work through the initial wet stage until the dough starts to form soft, smooth skin. I made all the kneading in my stand mixer - which makes making bread, rolls so much easier! When your dough feel smooth and silky, put it into a lightly oiled large bowl. Cover with tea towel and leave to rise until at least double in size - at least 1 hour, but it's fine to leave it for 2 or even 3 hours. Line two baking trays with baking parchment or silicone paper. Tip the dough onto the work surface. Fold it inwards repeatedly until all the air is knocked out. Divide into 14 equal pieces (each about 60 g). Roll each one into a ball by placing it in a cage formed by your hand and the table, and moving your hand around in circular motion. Place the dough ball in the middle of each tray and position the rest of the balls around, so they are almost touching and you have 7 balls on each tray. Cover the balls with a plastic bag and leave to prove for 1 hour or at least until double the size. Preheat the oven to 210 C. Dust the rolls with flour (I dusted mine with fine semolina, as I don't like flour on top of my bread/rolls). Give each roll 3 little snips with scissors, leaving the one in the middle untouched. Bake for 30 minutes, until the rolls are golden in colour and sound hollow when tapped on the base. My rolls took only 25 minutes to bake so keep an eye on them! Leave to cool on a wire rack. Delicious simply with butter.